To discover the romance of travel as you journey to iconic resorts or far flung destinations where authentic, memorable experiences await provides a true appreciate of where you are in the world. 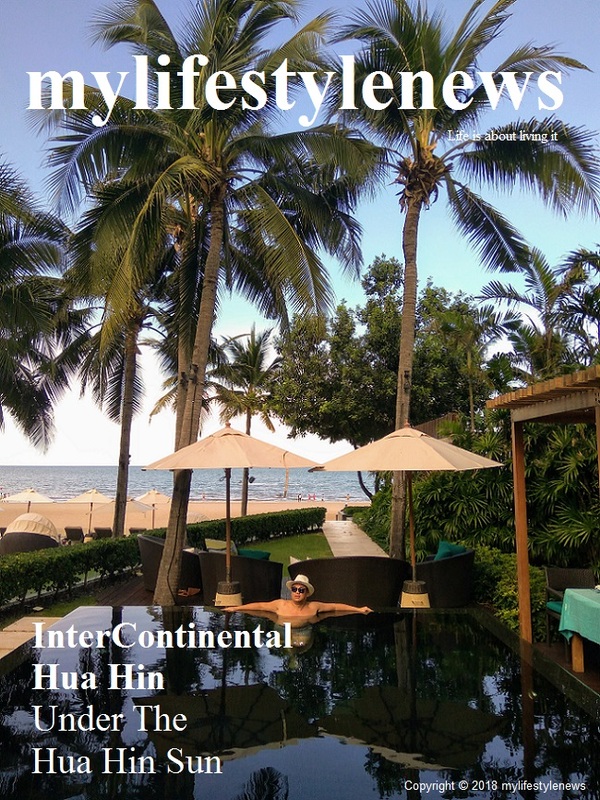 mylifestylenews explores the wonders under the Hua Hin sun at the InterContinental Hua Hin Resort. It is a joy to be staying in a beautifully laid out property where architecturally everything is desgned to face the beach and you have the sea views wherever possible. The InterContinental hotel brand is synonymous with elegant luxury, but there are so many variations when one begins to travel and stay at different properties in different parts of the world, but encountering the InterContinental Hua Hin resort is a wonderful surprise. White shuttered windows with a hint of colonial motif wraps around the entire building on the bustling Petchkasem road. With the new wing extension accompanied with additional resort facilities and adjacent to the new BlúPort Hua Hin Resort Mall, this is another highlight to stay in this area in Hua Hin. Our arrival experience was pleasant despite the 36°C heat with over 80% humidity outside the resort that may demand you finding some shelter with shade at once. Blossoming frangipani trees and soaring high palm trees provides the perfect shade along the resort entrance driveway which is well balanced with the running water wall feature immediately adding the harmony effect. The moment we stepped into the foyer through ceiling high entrance glass doors, the cooling air-conditioned foyer calms us down at once and have us forgetting about the hustle and bustle of the street outside. The lobby is not massive for a resort standard yet with a certain intimacy. White orchids are well arranged in two large caged pots in the middle of the foyer contrasting the tone of the flooring with frangipani motif that harmonize with the colonial charm. Looking up, you will see metallic colored fishes are hung in irregular swimming directions and minimal lighting to offset the glare of the summer sun outside so you feel as though you have entered a cooling space which makes you look forward to the experiences that will unfold. The staff are a little cheeky in a nice way by cracking some jokes yet carrying a good warm smile, polite and well trained to offer the InterContinental hospitality. The resort unfolds as we were escorted to our room, with a beautiful green lawn expanse framed with more frangipani trees that offer you a fragrant welcome in the Hun Hin summer sun, which segues into the resort swimming pool areas and gives you an uninterrupted seaview of the beach. Our InterContinental Club Room was one floor up above the ground level on the beach wing. There is a white long corridor in Colonial design influence with wooden shutters on the balcony surrounded with palm trees offering a more relaxing ambience to the resort. The room is an open plan design, with the bathroom able to be enclosed with sliding doors with a great touch to keep that airy feeling and flow of space. Our room faces east and we were awoken by an incredible sunrise over the sea. There is much more of a holiday atmosphere in terms of the room design. A bubble bath scattered with rose petals awaits our arrival and gives another personal touch for the Club InterContinental booking. L’Occitane toiletries are offered in the spacious rain shower cubicle and his and hers vanities. The space is sensibly designed for suitcases and enough wardrobe space to hang up some essentials and spread yourselves out and facilitate with modern technology with touch button control. Morning Tai Chi practice on the resort beautiful lawn. The InterContinental Club benefit continues for you to enjoy a greatly elevated level of hospitality and with personalized services. The spacious beachfront club lounge defines the Club experience set adjacent to the main swimming pool and blending deftly with the resort’s distinctive design motifs, allowing you to sweep the Gulf of Thailand views while enjoying numerous amenities exclusive to the Club-level guests. The lounge serves daily all you can order a-la-carte breakfast, afternoon tea and pre-dinner cocktails with full access during its operating hours. The resort-wide benefits extend to every aspect of a stay including advantages such as personalized butler service, packing and unpacking services, luxury “Bath Time” amenities, complimentary services and more to pamper your stay. One could say it is a haven of refinement, but as we are in a resort, we could still totally relax while letting the Club Lounge team pamper and indulge us throughout the day. All the team offered incredibly personalized service with great attention to detail – even informing you how long to let your tea stand for the perfect brew with a timer to remind you – and we couldn’t fault a thing. The cooked canapés were superb, ranging from Thai dishes to European classics and while they were only bite size, they were bursting with flavours together with a fair selection of alcoholic beverages. In addition, it also provides convenient check-in and check-out services and attains new heights of luxury with genuine Thai hospitality. 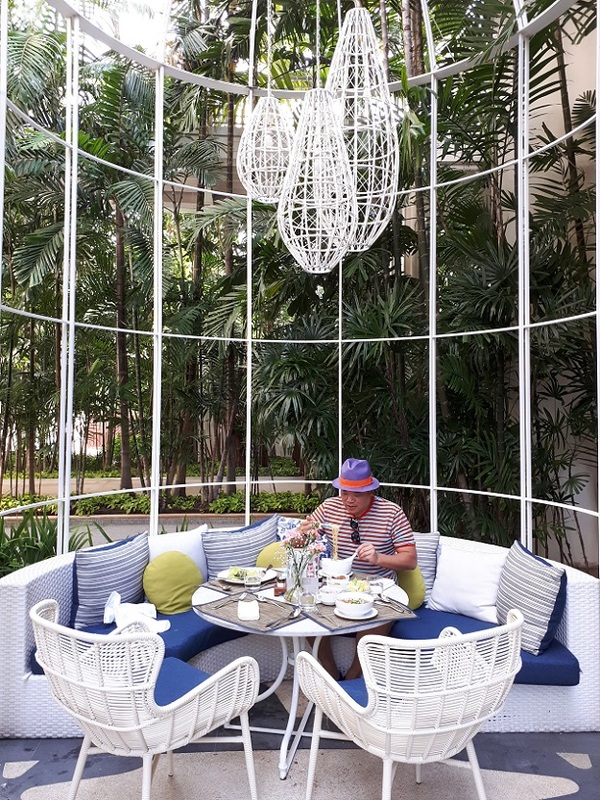 Breakfast is also served outdoor at the beautiful courtyard. Under the glare of a scorching Hua Hin sun, a hydration recharge is necessary. Private sundecks with sun lounges are exclusively reserved in front of the Club Lounge designated area. Soak up the sun as you please. A gorgeous seaview overlooking the Gulf of Thailand. Retreat from the sun in peace while immersing yourself in tranquil surroundings and do your laps in the turquoise aqua pool at your own pace. Summer cicadas make sounds and a soft breeze gently fans us to the accompaniment of a chorus of frogs hidden in the surrounding ponds. As the sun starts to set, we begin to wonder, soaring the late afternoon sea breeze along the pool deck, we have found ourselves in a more serene sanctuary from Hua Hin’s unsettling beauty. When all touch points are met, a memorable experience with heartfelt hospitality defines an unforgettable staycation and the InterContinental Hua Hin is an absolute shrewd move.